The sea phase will happen between December 19 and 21 in the waters of the Bay of Bengal. The joint Indo-Russian ‘Indra’ naval exercises being held in two phases, coastal and sea-borne, between December 14 and 21, 2016, will further strengthen bilateral friendship. 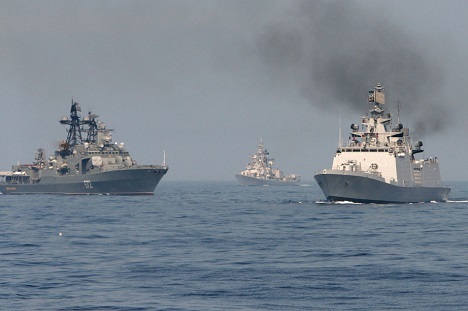 The Russian-Indian naval exercises ‘Indra’ Navy-2016 will serve to strengthen friendship between the two countries and their cooperation in the field of maritime security, said the Indian Ministry of Defence. “The Indra Navy-2016 exercises will help to further increase mutual trust and improve communications, as well as provide an opportunity to exchange best practices in the naval forces of the two countries. In addition, these exercises will be another milestone in the strengthening of cooperation between the Navies of the two countries in the field of maritime safety, and help strengthen the time-tested ties of friendship,” said the ministry press release. The Defence Ministry also said that the missile destroyer Ranvir, the frigate Satpura, the small anti-submarine ship Kamorta, as well as a submarine, anti-submarine patrol aircraft P8I and Dornier, the fighter jets Hawk, and helicopters would be participating from the Indian side. Participating on the Russian side in these manoeuvres will be the large anti-submarine ship Admiral Tributs and the large sea tanker Boris Butoma. The exercises are being held from December 14 to 21, 2016. The coastal phase of these exercises will be held from December 14-18 in Visakhapatnam. During these exercises, the two naval teams will hold meetings on cooperation, tactical briefings, exchange official visits and receptions, and participate in sports and cultural events. The sea phase will happen between December 19 and 21 in the waters of the Bay of Bengal. The participants will conduct training exercises in communications, practice various scenarios for repelling air attacks, nighttime ship manoeuvering and artillery firing at air and sea targets, conduct inspections, resupply operations on the move, and much more. In addition, a number of training tasks will be performed by ship-borne helicopters. The international naval exercises will be led by the Indian Navy.